Ahhhh…casseroles. You know that fall has arrived when the casseroles start appearing. I’ve been on a bit of a “superfood” kick recently. It can’t hurt, right? Maybe it’s my age (ahem..), but I can’t eat too much junk food anymore. Wipes. Me. Out. 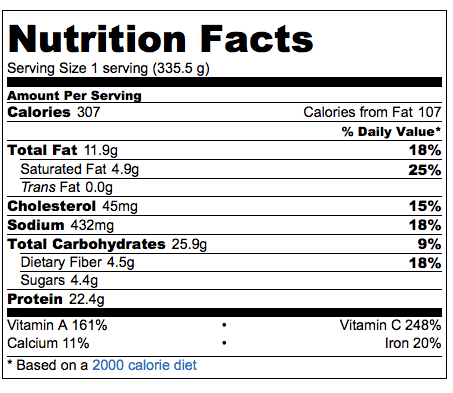 This kind of food? This gives me more energy, it doesn’t deplete me. And the kale? It’s good! I’ve grown up eating all kinds of greens, but kale wasn’t one of those greens. When I learned that kale was one of the most nutrient-dense foods out there, I just had to incorporate more of it into my diet. The other change is the use of quinoa in the place of rice since quinoa has more protein and is a better grain in general. Normally we have always made these peppers with ground beef and rice. I’ve tried to sneak spinach in them in the past. It’s easy to sneak spinach in places, I think. Aside from the look of it, I don’t think it has an overwhelmingly obvious taste. 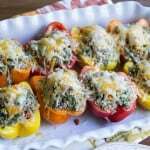 I enjoyed this healthier version of stuffed peppers. Hope you give them a try! In a large saute pan, heat the olive oil over medium high heat and saute the onion and garlic for 1 minute; add the kale and diced bell peppers and cook for 3 to 4 minutes until vegetables have softened; remove and set aside. Remove foil, top with cheese and bake for an additional 10 to 15 minutes until cheese has melted. Hits all of the current hot spots! 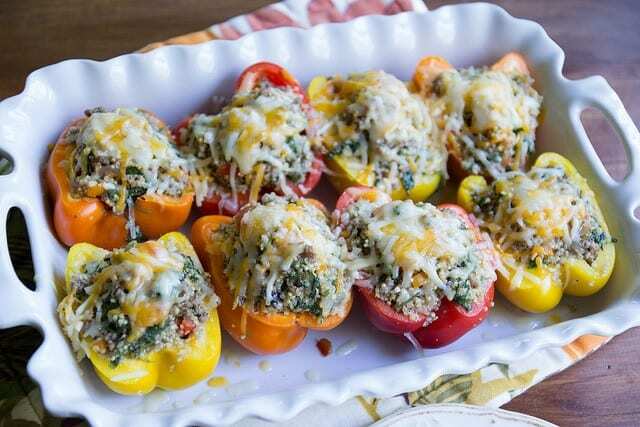 Luv the use of quinoa in these stuffed peppers – such a gorgeous looking dish! Thanks! I think the quinoa definitely adds an interesting spin!